Deluxe timing belt kit for Audi A4 and VW Passat 1.8T with an AEW or ATW. Don't let your belt break and destroy your engine! This all inclusive kit of parts that are OEM or better manufacturers and includes a thermostat, water pump, upgraded pump gaskets, and even serpentine belts (many kits overlook these). Kit Includes: OEM Gates/Conti Timing Belt --- 058109119C OEM Belt Tensioner --- 058109243E OEM Tensioner Damper --- 058109479B OEM Relay Roller --- 058109244 OEM Power Steering Belt --- 058145271 / 11x528mm OEM Alternator/Power Steering Belt --- 5PK1300 OEM Air Conditioning Belt --- 4PK0855 (or 56) OEM Thermostat with O-ring --- 050121113C OEM Crankshaft Seal --- 054115147B/034115147A 2x OEM Camshaft Seals --- 068103085E/A Graf/Geba/Hepu Metal Impeller Water Pump --- 026121005H/L Upgraded Metal Pump Gasket --- 026121041M/P. Fits the Following: September 1997 - May 2000 VW Passat 1.8T (AEB, ATW) July 1996-May 2000 Audi A4 1.8T (AEB, ATW). 1.5L G12++ Coolant (Backwards Compatible with all pink/red G12 based coolants). We know this fits lots of international engines, but we cannot guarantee fitment on vehicles manufactured outside North America. We think it MIGHT fit the following, but your best bet is to check with your local dealer and see if this will fit you model. We are not responsible for fitment issues outside North America! Power & torque outputs, ID codes & applications. VW Polo GTI, VW Golf Mk4 GTI, VW Bora, VW New Beetle, VW Passat B5 and VW Sagitar. Also on the Audi TT Mk1 (8N), Audi A3 first gen. , Audi A4, Audi A6, koda Octavia and SEAT Ibiza. We carry a number of kits for similar vehicles (see below). The displayed rates are a guide; individual rates vary by country. 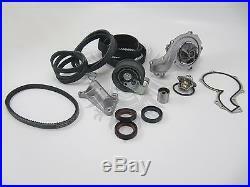 The item "VW Audi 1.8T Passat A4 Deluxe Timing Belt Kit Water Pump Early B5 AEB ATW'97-00" is in sale since Tuesday, September 17, 2013.